The SAMI Galaxy Survey Data Release Two is now available! Data Release Two includes data for 1559 galaxies, about 50% of the full survey. Galaxies included have a redshift range 0.004 < z < 0.113 and a large stellar mass range 7.5<log(M*/Msun) < 11.6. The core data for each galaxy consist of two primary spectral cubes covering the blue and red optical wavelength ranges. For each primary cube we also provide three spatially binned spectral cubes and a set of standardised aperture spectra. For each core data product we provide a set of value-added data products. This includes all emission line value-added products from Data Release One, expanded to the larger sample. In addition we include stellar kinematic and stellar population value-added products derived from absorption line measurements. The data are provided online through Australian Astronomical Optics' Data Central. IFS data cubes and all 2D data products can be accessed through the AstroObject page. Please see the "How do I" instructions on the right-hand side of the page for an easy guide on how to download the data. With the Single-Object-Viewer (SOV), you can inspect all SAMI DR2 products for each individual source in DR2. The Schema Browser is there to help you find specific data products. 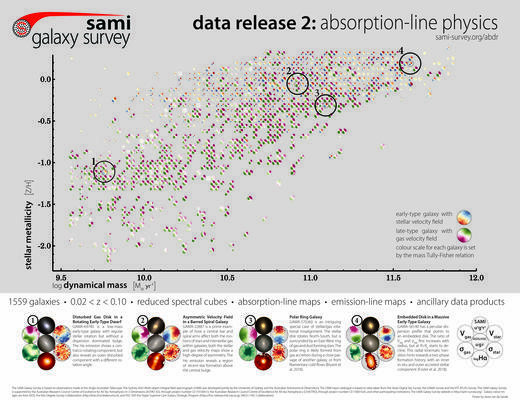 For Further details see the paper "The SAMI Galaxy Survey: Data Release Two with absorption-line physics value-added products", Scott et al. (2018), MNRAS submitted.